This retextures the puzzle door effect seen in dungeons. This retextures the puzzle door effect as it slides down releasing dust to drop, it does not change the actual texture of the door or it's surroundings, just the dusty effect when it is opening. I thought it needed some attention as the vanilla effect looks like the friction is causing smoke. It will also compliment my DUST mod with it being a dusty effect. This is not compatible with any thing which changes the effect mesh. 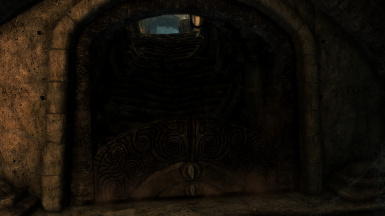 It does not change the actual texture of the door or it's surroundings only the actual dust dropping effect so any retextures of these objects are compatible. version 2.0: Worked on all textures to make them look more dusty. Added a sound file to fit more with the effect. Another fantastic video from Supertin. Thanks very much my friend.